I know I’m the queen of online shopping; I do almost all of my shopping online including my groceries. The reason is pretty obvious; it allows me to access all kind of shops just at the comfort of my home. I’m a homebody and that’s like heaven-sent; while lazing on the couch I can get my shopping done in a jiff. I have tons of reasons why I opted for online shopping but now I can add one more reason why you too should do your shopping online. I’m sure this is not news but since I found ShopBack, I’ve been enjoying online shopping so much more because I can benefit (read: do more shopping) from the rebates or some people may call it cash back. Not news right? If you are that one individual who never heard of ShopBack, let me tell you what it is. In a nutshell, ShopBack.com is a cash back portal where you can literally get your cash back if you browse through the ShopBack site, select the merchants and continue your shopping from there. On top of the cash back, you also can enjoy the existing discounts and voucher codes that they usually have every weeks. Trust me, it never ends. 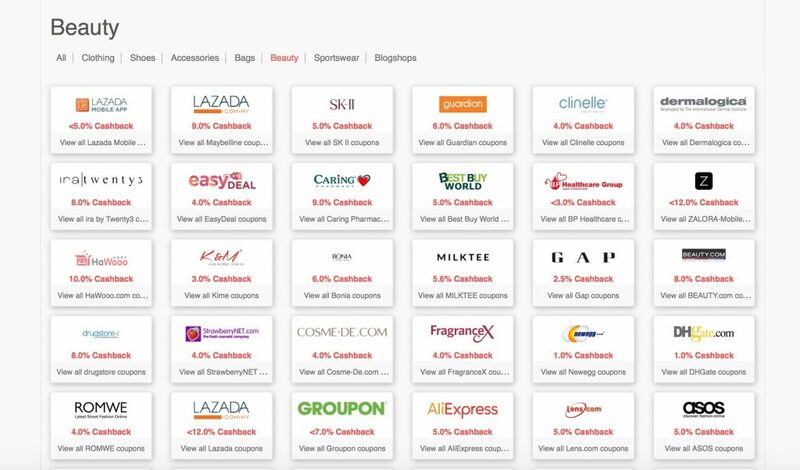 And for that very reason, I think ShopBack is the best cashback site for online shopping discounts that you can find in the most part of South East Asia (Malaysia, Singapore, Indonesia and Philippines). I found out about ShopBack earlier this year and I also got my husband to try it. I mean who would pass this kind of opportunity right? Just look at those deals. Be sure to subscribe to ShopBack newsletter so that you won’t miss anything. There are over 500 merchants that you can choose at ShopBack but for a makeup/skincare junkie like me, my eyes will always be on merchants like Hermo, Sephora and Althea. Hermo.my is everywhere now because I can say that it is the leading site in Malaysia where you can get most of your staple Korean, Taiwanese and Japanese products. I personally shop there at least once a month because I just couldn’t resist the temptation to enjoy Hermo cashback and vouchers that ShopBack offers. Any woman who loves makeup loves Sephora; that’s a fact. I’m sure everyone in the beauty community has different opinions about Sephora but I think that one thing that we can agree on is Sephora is quite miserly in some way. There are hardly any discounts (twice a year for Black Card member) but we keep on shopping there because Sephora is that good. I think no woman in her right mind can fight the urge to shop at Sephora. But don’t worry friends; I have good news for you. Now, with your access at ShopBack you can find the latest Sephora coupons and you will get at least 2% cash back. What? Isn’t that great? If you’ve been eyeing the newly arrived (in Malaysia) Kat Von Dee Shade + Light contour palette, maybe now is the right time to buy it with ShopBack. ? What else is there at ShopBack? Let me just say that it is not only constrict to beauty deals; there really is something for everyone. There are few categories that you can choose from; fashion, travel, food and beverage, electronics and lifestyle. I’m sure you’ll find something that meets your needs. For my last vacation to Bali, I booked my flight tickets and hotel using Expedia and I casually used ShopBack to get rebates. The rebates sums up to nearly RM200. ? Amazon.com is a really a great place to find things that we can’t find in Malaysia but we usually didn’t end up buying things that we’re looking for because the merchant does not ship to Malaysia or because the cost of shipping is ridiculous. Bummer! ShopBack has a solution for this. I’ve never tried service this but I’m looking forward to try it. This is too good. With ShopBack.com, you can shop at Amazon.com without worrying about the cost of shipping. 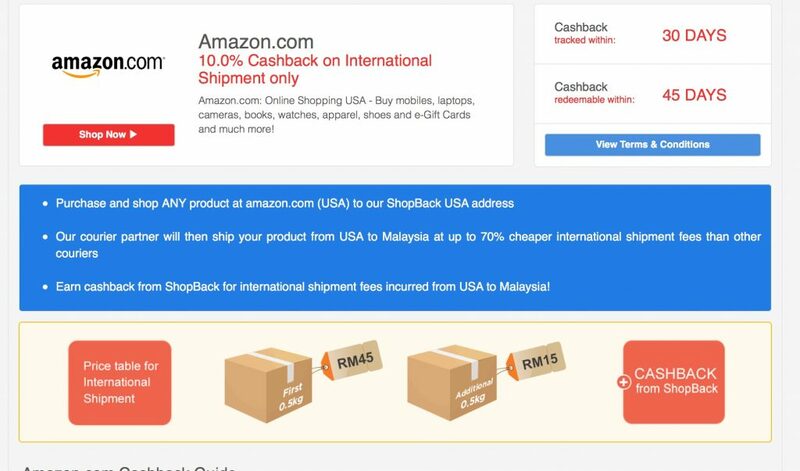 The items that you buy will be sent to ShopBack address in U.S and from there it will be on its merry way to Malaysia with a very reasonable cost of shipping. Man, this is what I called the deal breaker! I’m going to be really honest here because being honest never hurts anyone, right? The experiences I had with ShopBack were smooth and very pleasant. No hassle and the website is really easy to navigate. If you are new and find it difficult to grasp the concept of cash back with ShopBack, I suggest that you watch the introductory video below and I’m sure it will be crystal clear afterwards. My personal ShopBack account. Look at my total earnings! Don’t wait. You should try ShopBack now because it’s free and be on your way to better way of shopping already. Join now.